Footwear is designed to meet mankind's needs like protection, support, comfort, sturdiness, and stylishness. Footwear plays an important role in the development as well as prevention of foot and toe problems. Feet endure tremendous pressures of daily living. An average day of walking brings a force equal to several hundred tons on them. They are subject to more injury than any other part of the body. Protecting them with proper footwear is important. Foot health can be a clue to overall health. For example, joint stiffness in the toes could mean arthritis. Tingling or numbness could be a sign of diabetes. Swelling might indicate kidney disease, heart disease or high blood pressure. Some of the common foot problems are bunions, calluses, corns and hammer, claw and mallet toes that develop over time. These problems can range from being uncomfortable to painful. In severe cases, they can make it difficult to even wear the foot wear. • Try on shoes at the end of the day, when your feet are at their largest due to normal swelling. • If you have shoe inserts or orthotics, take them with you to test them out in various shoes. • Shoe size, especially width, may change with age. Having both feet measured ensures a good fit and identifies which foot is larger. • Stand during the fitting process to get an accurate sense of the fit. • Walk around the store to make sure that the shoe fit feels right. • If a shoe feels right but isn't your normal size, pay attention to how it feels. Ignore shoe size. • Avoid high-heeled, narrow, or pointed-toe shoes. High-heeled shoes increase pressure on the front of the foot and on the toe joints. • Go for a wide and deep toe box (the area that surrounds the toes). There should be space between your longest toe and the end of the shoe. You should be able to wiggle your toes in your shoes. • Look for a rigid yet cushioned heel counter that keeps your foot from slipping out of the shoe. 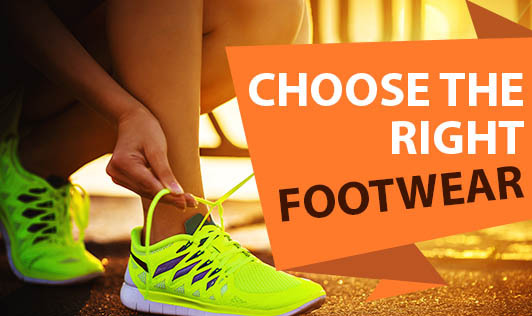 • Choose a flexible sole that allows your toes to bend as you walk. • A shoe that allows the ball of your foot to fit snugly into the widest part of the shoe. • Athletic shoes are a good choice. • Shoes that breathe when your feet sweat. Avoid plastic or vinyl shoes. • Wear sandals or soft-leather flat shoes or slippers or cloth shoes. • Go barefoot as much as possible (or just wear a sock) unless you have diabetes or peripheral arterial disease or other conditions that decrease the feeling in your feet. People who have these conditions and have limited or no sensation in their feet are encouraged not to go barefoot because unnoticed injuries to their feet are more likely to become infected. Athletic activity imposes much stress, and if not wearing proper foot wear it may result in damage. There is a variety of shoes available, so be sure to consider foot type, sturdiness and fit while making the selection. For longer use, keep shoes clean and in good repair. Give your shoes a chance to breathe - don't wear the same pair two days in a row (you prolong the life of shoes by rotating their use). Good foot care and regular foot checks are an important part of your health care. If you have foot problems, be sure to talk to your doctor.